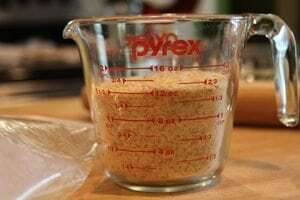 From the day I started this blog, there has always been one recipe that I wanted to share, but couldn’t. It’s my grandfather’s recipe for Lemon Icebox Pie. From the time I was a kid, it has always been a special treat for Papa (we pronounce it paw-paw because we’re good Southern speaking folks) to squeeze fresh lemons and make his Lemon Icebox Pie. But in the last few years, we’ve gotten fewer and fewer pies from Papa. You see, he developed a debilitating depression that completely changed the person he was. The usually outgoing, fun-loving, fill-every-day-to-the-fullest man became a man that rarely ever got out of the chair. It’s been so frustrating and sad to see what this disease has done to him – how it’s changed him into a person that I still don’t recognize. It’s funny though, despite the fact the we all love Papa’s lemon pies, no one has ever attempted to make them. That’s always been Papa’s job. I’ve been asking him for the recipe for years, and I’ve never been able to get it out of him. I’m not sure if it was the depression that made him think he couldn’t remember the recipe or it was him just not willing to let us in on the secret. 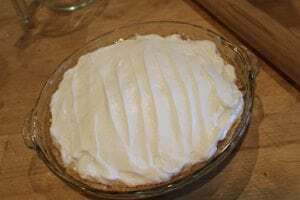 Regardless, I could have jumped on the internet and found thousands of Icebox Lemon Pie recipes – I knew most of the ingredients he used, just not the exact amounts – but I didn’t want someone else’s recipe, I wanted my Papa’s recipe. I wanted to hear him tell me how to make it. I wanted him to be his old self enough to tell me the recipe. Well, this weekend… he told me the recipe. And sure enough, the exact recipe is all over the internet and I could have been making these pies years ago. But I didn’t want those pies, I wanted my Papa’s pies. And now I can have them. This disease has affected our family like nothing else ever has. Sure he has good days and bad ones. But we are confident that one day, we’ll have our old Papa back. Hope and faith are about all you can count on when dealing with something like this. I urge you if you or someone you know is battling depression, get help. Talk to someone. I’m telling you this pie will knock your socks off. It is a great tart, cool summer treat! Maybe it will become a favorite in your family too. First, you’ll need to crush the Nilla Wafers. You can certainly use a food processor for this, but I crushed them using my rolling pin just like my Papa’s does it. Combine the cookie crumbs with 1 stick of melted butter. Press into the bottom and sides of a glass pie dish to form the crust. Next, separate your eggs with whites in one bowl and yolks in another. Juice the 3 lemons. 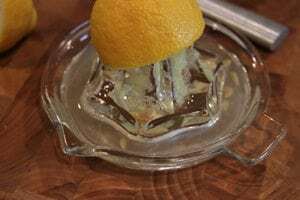 I usually run my lemon juice through a strainer to be sure there are no seeds. Combine the egg yolks, lemon juice, and sweetened condensed milk in a large bowl. Pour into crust. Now we’re going to make our meringue topping. I used my stand mixer for this, but you you can also use a hand mixer. 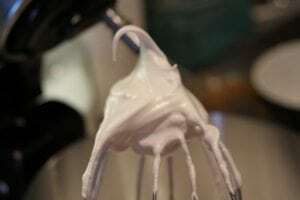 Beat the egg whites until white and frothy. Spread meringue on top of filling being sure to cover entire pie to the crust with meringue. Bake in a 325 degree F oven for 15 minutes. You can also turn on the broiler for a few minutes to toast the top of the meringue a little more if you so desire. Just watch it closely! Preheat the oven to 325°F. 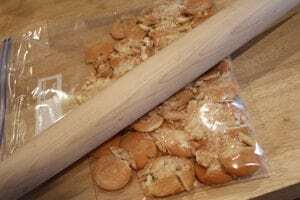 Crush Nilla Wafers using a food processor or by placing the cookies in a zip top bag and using a rolling pin. 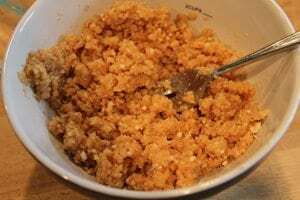 Combine the cookie crumbs with melted butter. 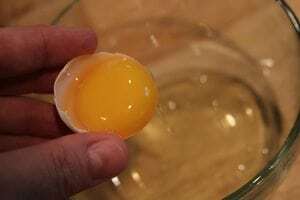 Separate your eggs with whites in one bowl and yolks in another. 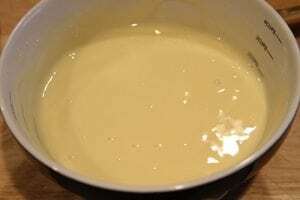 Combine the egg yolks, lemon juice, and sweetened condensed milk in a large bowl. Mix well. Pour into crust. 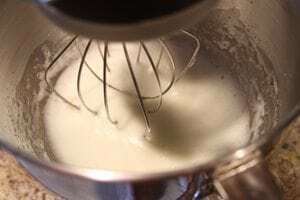 Beat the egg whites until white and frothy. Bake for 15 minutes or until the meringue is just starting to turn golden brown. Yum! I love Lemon Meringue Pie and I love that your papa was the piemaker in the family. My papas were not allowed to touch anything in the kitchen! 🙂 I’m sorry about your grandfather’s depression. My grandfather, who passed away last year, suffered from dementia and was not himself for quite some time. Not the same — but I can relate in part. Thanks so much for sharing! Thanks for the comment, Rachel. It’s one day at a time. Yes, this pie should stay refrigerated. I am soooo sorry! I’ve never had a Paw Paw. Both of mine passed away before I was born. Bless his heart! I pray he will come back to his old self again. Thanks for the prayers, Tammy. 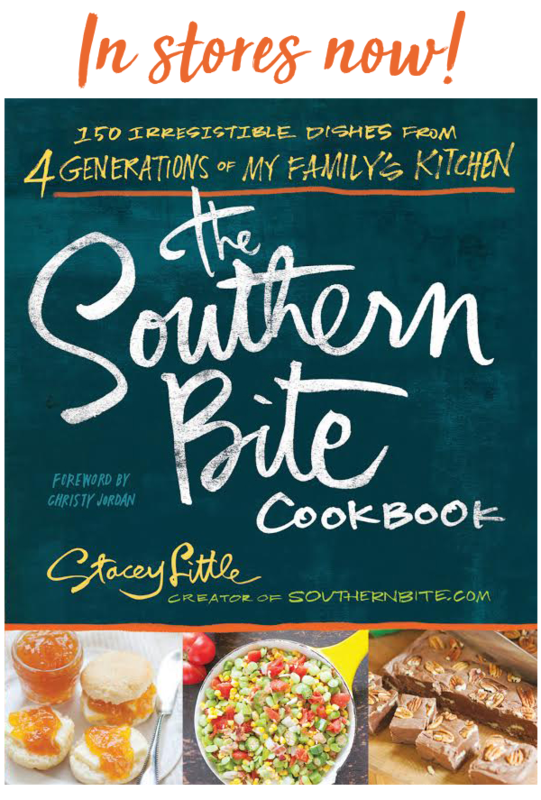 Stacey I can’t thank you enough for sharing your story and your Paw PAW’S recipe. I lost my Maw Maw many years ago and have been trying to make her icebox pie also. Well I didn’t think I would ever get it taste that memory ever again, but thanks to you sharing I can now make my Maw Maw’s pies. I also suffer from depression and I just want you to know that this really touched my heart. I lost my husband of 28 years on Thanksgiving of 2014 and he was the cook of the family. So at 58 years of age I had to take on the chore of cooking and baking. I have come to enjoy it quite a bit when the depression allow it. I am working on the grief and depression at the same time and with the guidance of God I think I will make it through. God bless for giving me this receipe to enjoy again and be happy to know that I have a great nephew who loves to cook and bake and I will pass your Paw Paw’s receipe on to him so his pie will now be our tradition. Thank you, Roberta Verrett, Patterson, La. Oh, Roberta, I’m just tickled you found something close to you Maw Maw’s recipe. I’m so very sorry to hear about you’re papa. I will be keeping him in my prayers. I could imagine it’s hard, fighting to feel ok and just can’t do it as much as you’d like to. He has y’alls love and support and the good Lord is there. I hope him sharing the recipe brought back good memories and thank you for sharing it with us. I’m gonna make it tonight cause it sure is hot, lol. It was quite a special event that he shared the recipe with me. Thanks for the prayers and hopefully the pie cooled ya down a bit! Stacey this pie is delicious! Enjoying my 2nd piece tonight, lol. And it was so easy, the hardest thing I had to do was separate the eggs! Thank your Papa for me and thanks again for sharing. Have a great day! Wonderful! It just warms my heart to know others out there are enjoying this recipe! Thanks for sharing! Keep these wonderful recipes coming. Love, love them! Hi Peggy! Welcome! I hope you’ll find plenty that interests you here! Thank you for sharing this recipe. I’m thinking it is going to taste just like my great-aunt’s lemon icebox pie! I know what it is like when a beloved relative is overcome with a disease that changes their personality; I wish all the best for you and your family. Thanks so much, Karen. I hope it does taste just like your great aunt’s! Sorry about your Papa. Our mom has dementia, so I kind of know what you are going through. It is hard. God bless you and thank you for the recipe. Thanks, Linda. It’s a tough thing to deal with, but we’re just taking it one day at a time. Sending prayers up for you, your mom, and your family. I know how difficult his depression has been on you all. I am glad I had the privilage of meeting the real Papa..prior to the depression. I’m so glad you got to meet him then, too! Would it cheer him up if we sent cards to him? We’ll keep your Papa in our prayers. I’m going to try his recipe soon. Bless His Heart! Thanks for the prayers, Sabrina. I hope you enjoy the pie! LOVE your story ~ NOT the part about your Papa’s depression, I hope he is back to his old ‘self soon ~ and LOVE your Papa’s recipe, honored to add it to my recipe box and look forward to trying it! Thanks, Melanie. I hope you enjoy as much as we do! Can’t wait to try it. I love anything lemon. Your Papa sounds wonderful. Thanks for sharing, Joyce! I hope it brought back great memories for you. Stacey, You are big time now. I just read a real nice articule about Southern Bite in the Montgomery, Alabama newspaper today. It featured the Okra Fritters. I wish everyone could read it. Great job!!!!!!!!!!!!!!!!! LOL! I was so pleased when they called about doing an article! Thanks for the comment! The pie look delicious. Your story really touch my heart. It reminds me to never take time for granted. I hope your papa is feeling well. He has good days and bad days, but don’t we all! Thanks, Cindy and you’re right… we all should do a much better job appreciating all the small things. Stacey, congratulations for being a cooking celebrity today in the Montgomery, Alabama newspaper featuring your delicious Okra Fritters. What a great job! WOW! what a miracle you received from your PaPa this weekend, for him to actually tell you in his own words how he made his Lemon Icebox Pie after all those years of not having his recipe. The Lord works in mysterious ways, we just have to be thankful for the right moments when they come to us. I hope at that moment you had a family member to video the event between you and your PaPa with him giving you his recipe word-for-word. When most of my family was alive, I would video a lot of our family events. Now, so many have gone, but I have the videos to go back and look at and they bring me a lot of closure when I’m sad and miss them. But regardless, you have what you wanted from your Papa and that was for him to tell you in his own words how he made his pie and to me that is a miracle all in itself. 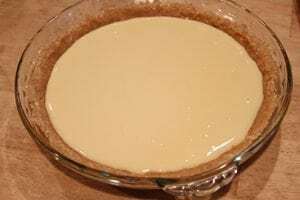 I’m definitely going to make PaPa’s Lemon Icebox Pie because I love anything that is lemon and this recipe sounds yummy! You hang in there! Your Papa would be so proud of you, the pie tasted just like your Papa’s. Love to you my wonderful son !!! Your story about your Papa just made me tear up. I’ve struggled with depression off and on most of my life, so I’ve got an understanding of the kind of valley he’s walking through. If there’s any way at all you could convince him to talk to a doctor or therapist about it, it’s worth trying. I know that when I finally sought help a few years ago, it completely turned my life around. Don’t ever give up on him – being surrounded by people who believed that I would get better meant the world to me, even when I couldn’t believe it for myself. You and your Papa will be in my prayers. Hi Casey! Honestly, I’m not a huge meringue fan either, but I like this when it’s fresh. After a day, I just end up scraping the meringue off and eating the rest. The cooking is just for the meringue. 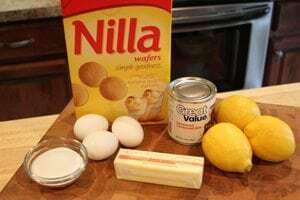 It’s not necessary for the filling since the acid in the lemon does a good job of “cooking” the egg yolks. But, if you’re a little concerned, I bet it would be fine to cook it a bit. It will probably develop a film or skin on top of the filling, but probably would change the taste at all. Stacey, I’m so sorry to hear about your Papa. My heart breaks for you and your family. If you’ve read any of my work at all, you will know how important family is to me. You are doing a very noble thing by writing about your food memories. Those stories are now documented for every one and that connection will never be lost. I still make myself do ugly crying when I’m writing some of mine. I think those turn out to be some of my best work. God bless you, Stacey. Stacey I love your PaPa too..he was always my fav. uncle and what has happened to him has broke my heart..but I know he is, was and always will be proud of you…keep the receips coming I remember so many from my childhood like this pie..mary b. Thanks for the sweet words. He was and still is a GREAT man! i MADE THE LEMON ICE BOX IT DIDN.T TURN WHAT COULD i HAVE DONE WRONG? This is the exact pie my mama would make for me when I was a child and not feeling well. She was not much of a baker/cook, but she perfected this pie. After she died, my great aunt would always ask me to make this as it was her favorite, too! I feel for you and your family. Depression is a difficult condition that affects the entire family and frustrates everyone because they feel so helpless. I hope that your Papa’s action of giving you this recipe is a sign of improvement in his condition. I will pray for him and your family. Keep sharing these wonderful recipes that take me back to my childhood! Thanks so much, Patti! I’m so glad you continue to enjoy the recipes! My grandma used to make this with me as a kid. I don’t remember how soon I could eat it. lol. That’s really my question…. I know its stored in the freezer until its shortly devoured. I’ve always kept it in the fridge and I think overnight is best – at least 6 to 8 hours. My mother made this same pie. She always baked her crust for about 10 minutes and cooled it before filling it. I made one 2 weeks ago and had to give MOST of it away to my neighbors so I wouldn’t get a sugar overload…once you’ve had this pie, you will not be happy with any other lemon pie. This pie looks so good. Glad to have found your website. Very sorry to hear about your grandfather. I hope that things turn round. It’s not easy growing older. In your heart you are young but when you try to do the things you used to do? Not always easy. He’s lucky that he has family who care about him. Hugs to you and PawPaw. Hey there, this recipe sounds great. Want to save it but the button is missing. Sorry about your papa. Christy Jordan had something on her site today too about depression. She thinks of it as a visiting mule named Abner. I know you wish there was something you could do other than pray. Was wondering about the meringue. I’m making the pie today for Thanksgiving. Should i make the filling today, and the meringue tomorrow? Will it breakdown before Thursday? Thanks for your advice. Yes, I would wait and do the meringue tomorrow. I’m afraid it would weep. Happy Thanksgiving!! Just want to give a suggestion (my Mom made this for me for years when I was a kid).I have her recipe card but the lemon juice measurement had faded. Google to double check and wound up here. The card says to use a hand blender to mix egg yolks and condensed milk well then slowly add the lemon juice. The mixture will double. I remember this being the way she did it. Take Care! Stacy It is great that you have shared your grandfather’s receip! I was reared in Mississippi. I am now 81. As I remember, this receip came out when I was a small child taped to the top of the Eagle Brand Condensed Milk. The only difference is the original receip included the zest of one lemon stirred into the juice before adding. When I was pregnant for the first time my husband and I were with the military stationed in Ohio. My STONGEST craving was for this pie! I cannot tell you how many grocery stores I had to visit to find a can of Eagle Brand with this particular receip taped to the top!!! Now I live in Florida and am visiting in Texas. My son requested this pie. Thanks to your sharing your Papa’s receip I made my grown son a happy man last night! Wanda, I can’t thank you enough for sharing your memories of this pie and I’m just thrilled that you got to make your son so happy! Stacey, finding tihis post of yours truly made my day. This has always been one of my favorite pies, but I never could find “the original recipe”. This is it!!! I was able to get many of my mother’s recipes before her death, but this one I could never find. I remember her putting whole vanilla wafers around the pie. Not necessary, just langiappe as we say in Louisiana. Hope your “papa” is doing better. Thank you so much for sharing the memories and his recipe with us. May God bless and be with you all. Thanks so much, Mary Ellen! I do remember my grandfather putting the vanilla wafers around the edge sometimes, too. I’m so glad that you found the recipe. Hopefully the first taste will bring back all those memories like it does for me. My husband LOVES lemon pie. I made this yesterday and he said it was the best he’s ever had. Believe me, he’s had a good bit of lemon pie so that’s quite the compliment. Thank you for sharing. Well, that’s about the best compliment it could get! SO glad he enjoyed it! Last night, while eating his second piece, he said it was the best pie he’s ever had… Of any kind. nice! How funny! That’s really great. I’m SO glad he’s enjoyed it!! This post touched me so much, I was tearing up reading about your Papa because the story is so similar to mine. Growing up in South MS, my Papa worked on a boat that traveled the Mississippi and its tributaries. When he was home, he played guitar, sang, and cooked. A LOT. It was always such a treat to go visit when Papa was off work. His specialties were red shrimp gumbo and lemon icebox pie, so there are many cherished memories surrounding these particular foods for our whole family. My Papa did not suffer from depression, however when he was hit with the trifecta of mesothelioma, emphysema, and COPD he was always confined to his chair and his oxygen tank, struggling to breathe. No longer was he able to stand in the kitchen, walk around singing, play on the floor with the grandkids. No longer did he have the energy to tell funny stories or have long, meaningful conversations. He was too starved for oxygen. I thought that I remembered his recipe, but got online to double check my memory, and his recipe matches yours exactly. Thank you for sharing the recipe, and for sharing your Papa’s story. Oh, Jennifer! Seeing parents and grandparents age is such a tough thing to deal with. I’m so glad this post touched you and that you found the recipe. Bless you, Becky! Thanks for your sweet comment. Stacey! Do you know how BAD you are ?? 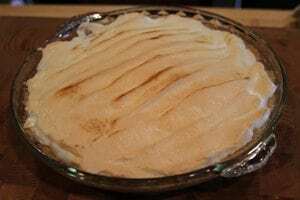 I am a Brit living in northern Portugal in a heatwave – it’s over 116˚ outside …has been on and off for days and is forecast for a few more – so I was looking online for a few COOL recipes … and LOVE Lemon Meringue Pie [Brit version – we cook the custard first] and saw your ‘Ice Box Pie’ – we don’t have those so it intrigued me .. especially the idea of ICE in this weather !!! I love your recipe – and am going to make this asap with my own lemons….. and then I am going to make it with my limes too .. I adore limes !!! But you are BAD because I then thought to go over to the Eagle Brand site – and look up recipes there for condensed milk [condensed milk is used a LOT in Portuguese desserts] and now …. I am quite sure I will be piling on the pounds !!! lol!!! I hope your grandfather is better – it’s so sad to see our loved ones go downhill. Much love to him and yourself. Thanks so much, Susan! I love to hear from the folks on the other side of the computer and I truly enjoyed you sharing with me. I hope you’ll enjoy both the lemon and lime versions. I know we sure do. Sorry for being a bad influence. Hopefully y’all will get some relief from those high temps. We experience some pretty high summer time temps here too, but not usually that bad. Our biggest problem is the terrible humidity! Hey girl, great recipe. I am going to use it tonight. My father is 70 and has been successful with his Depression for 25 years. 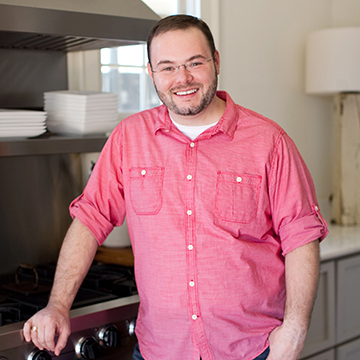 He has a secret Peanut Butter Brittle Recipe and I need to get it from him. Happy 2014 and my best to your Paw Paw. Made your pie today. 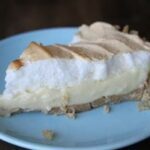 I have made lemon icebox pie but never before today had I used meringue. In fact, this may be the first meringue I’ve made in my adult life without the help of my mom to make sure I didn’t mess it up. …I did make a quick call to ask if I could leave it in the oven a little longer. It looks yummy! Wow, Stacey, you have tears rolling down my cheeks. I was looking for a lemon ice box pie like my Aunt used to make and stumbled across your blog. Your story about your Papa hits so close to home. My Granddaddy was one of the best cooks I’ve ever known. He could open near-empty cabinets and cook a masterpiece. We lost him a few years ago after a battle with Alzheimer’s. It broke my heart to see such a lively, vital person turn into someone who wasn’t himself. I miss him so much every single day of my life. I’m so happy for you that you finally got his recipe. What a wonderful thing to have to pass on to your own children. Those kind of heirlooms can’t be bought. Heirloom recipes are my favorite kind. My prayers are with you…and with your Papa. May God see fit to heal his terrible sickness and give him back to. you. So glad I found your blog, I’ve “liked” you on FB. From one southern cook to another…God Bless you. This is the exact pie my mother made. I have been looking for years. I hope your Papa gets better. Thank you! God bless you. Thanks so much, Taylor! Enjoy! Thanks for sharing the recipe. 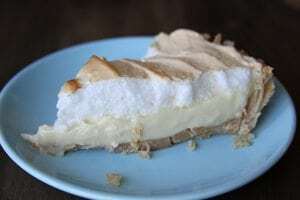 My Nanny makes the best lemon icebox pie, but it’s difficult to get a recipe from her because she just makes it no measurements and doesn’t write it down. Made two tonight. I can’t wait to taste them tomorrow! I sure hope you’ll enjoy them, Ashlee!! You can use a standard pie crust or even one made with graham crackers. Happy Thanksgiving to you. I’m going to make this pie tonight (as well as your Chocolate Silk pie) as my contribution to the family Thanksgiving meal tomorrow. I know its suppose to be a “summer” pie but my kids love it so much. I think about you and your papa every time I make it. Thank you for the recipe. You are so sweet to remember us. I hope you and your family enjoyed the pies and had a blessed Thanksgiving! This was very similar to my Grandmother’s receipe, she was from Arkansas, born in 1914. This pie was a family favorite and part of all the holiday family meals. She used the graham cracker crust and no meringue topping. 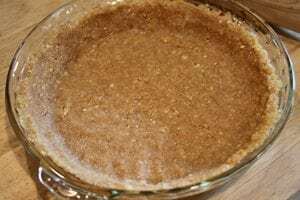 I just buy the graham cracker crust, and put the pie together in minutes. Then freeze for a few hours to serve. So fun to hear about all the variations on this delicious recipe! I’m in Australia and my Mum made the same pie (without the topping) when I was a kid and I always loved it (I’m now 47 and being the youngest out of 8, I think Mum would have been making this since the 1950s) Now I can make it myself as i never found her recipe. Thank you for taking me back to my childhood. Hey Stacey, the logos on the left side of your page cut off some of the recipe details. Can they be moved elsewhere? Very frustrating. Thanks buddy. Oh no! Let’s see what we can figure out. Are you talking about the social media share logos? What type of device are you viewing the site on?